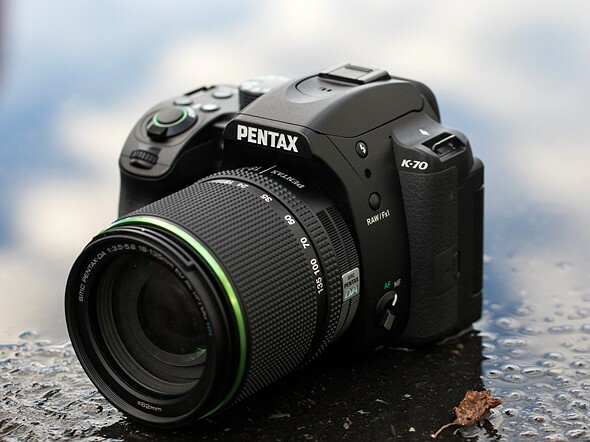 The Pentax K-70 is a mid-level DSLR that takes the basic architecture of their existing K-S2 and adds a new 24MP AA-filterless CMOS sensor with on-sensor PDAF, and a slew of other improvements. The sensor is cradled by Pentax’s famous ‘Shake Reduction’ in-body image stabilization system, and is protected from the elements thanks to weather-sealing and dustproofing. Clever use of the ‘SR’ unit enables the Pentax to perform a few tricks, such as the AA-filter simulator that reduces moiré and Pixel Shift Resolution that cancels out the Bayer color filter array by shifting the sensor one pixel in each direction, resulting in improved color detail and less noise.